Samsung Galaxy On8 has a 16MP rear camera with LED flash, f/1.7 aperture, secondary 5MP camera with f/1.9 aperture and 16MP front-facing camera with LED flash. 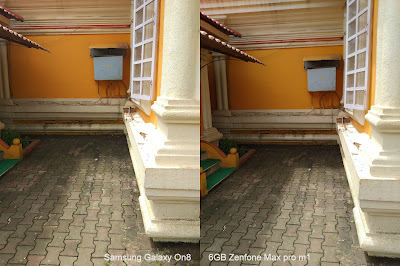 It comes with Live Focus mode and has support for 1080P Video recording. 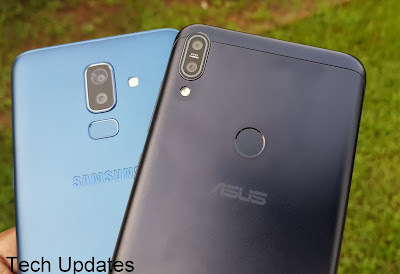 Zenfone Max Pro M1 has a 16MP rear camera with LED Flash, PDAF, 1.12μm pixel size, secondary 5MP camera and16 MP front-facing camera with soft LED flash, Rear Camera can record Videos up to 4K whereas 1080P on front Camera.